“Over the river and through the woods, to Grandmother’s house we go.” Those folk song lyrics are based on an 1844 poem by Lydia Maria Child. But they could also easily describe the work that Superior Propane drivers do when they deliver propane to remote areas in Ontario. 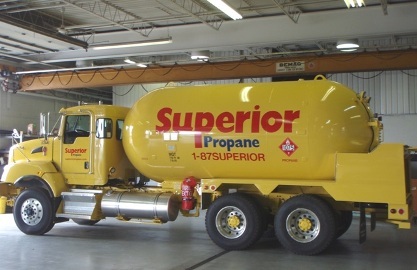 “We deliver propane far into the woods to customers with vacation homes and to companies running mines and hunting camps in some pretty remote areas of Ontario,” said James Pinder, manager of Superior’s fleet operations in Ontario. Superior has put the Kenworth T470 into operation in the more rugged areas, where for those deliveries, the company relies on the greater maneuverability and ground clearance Kenworth’s new T470 offers, he added. Superior Propane is Canada’s only national provider of portable fuels, equipment and service delivered directly to customers. Nationwide, it operates a fleet with 835 pieces of equipment, including trucks and trailers. In the province of Ontario, Pinder and fleet administrator Cheryl Combe manage more than 226 pieces of equipment, including 138 Class 5-8 trucks. A predominant number of the trucks operating in Ontario are Kenworths, Pinder said. Durability and drivability are the two main reasons why the company has chosen Kenworth models, particularly when it comes to the Kenworth T470. One of the company’s Kenworth T470s serves hunting camps and other similar remote locations in the area around North Bay in northern Ontario. Another Kenworth T470 serves in St. Rose, a town in the eastern part of Ontario, near the border with Quebec. A third Kenworth T470 is assigned to Belleville, a city near the mouth of the Moira River in central Ontario, west of the start of the St. Lawrence River. And a fourth Kenworth T470 was recently put into service in Whitby, Ontario, the center of the Durham Region of southern Ontario, east of Toronto, where it visits many construction sites. “With the new Kenworth T470s in specific applications, we’ve equipped them with a 4,330 U.S. water gallon capacity barrel and we’ve been able to get a 20 percent increase in carrying capacity,” he added. The Kenworth T470 also offers a more durable and a maneuverable truck chassis, which is important in the work that Superior Propane does, he added. The Kenworth T470 has a gross vehicle rating (GVW) ranging from a heavy Class 7 vehicle at 33,000 lbs. up to a light Class 8 truck at 68,000 lbs., and is for snowplow, dump, mixer, winch, refuse, and other heavy front-axle vocational and municipal applications requiring front frame extensions. The vehicle offers full parent rail extensions, delivering maximum resistance to bending moment (RBM) from one end of the rail to the other. The T470 is available with 12,000 to 22,000 lb. front axles, 21,000 to 26,000 lb. single rear axles, and 40,000 to 46,000 lb. tandem rear axles. Superior’s Kenworth T470s are equipped with 345-hp Cummins ISL engines and 6-speed Allison 3000RDS automatic transmissions with load-based shift scheduling, which automatically selects between economy and performance shifting based on the vehicle’s actual payload and the grade on which it is operating. Pinder said he relies heavily on the PacLease team, specifically Peter Roy, a PacLease national account sales executive in Canada. The team works closely with Kenworth to provide Kenworth trucks equipped with the specifications that help Superior to enhance productivity and profitability. PacLease recommendations also help Superior choose specifications that help make the trucks better working environments for company drivers. 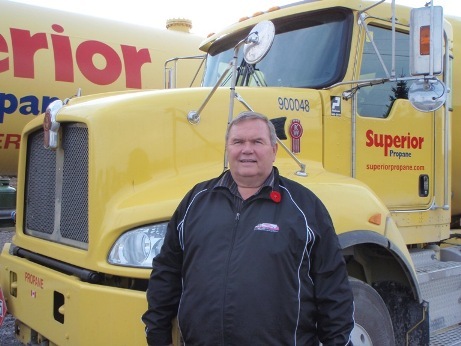 According to Pinder, Superior Propane drivers are very happy with the company’s 88 Kenworth trucks in Ontario, which include T370s, T800s and W900s. Running Kenworth trucks not only makes a difference with company drivers, but also in how others view the company. At the 25th annual Fergus Truck Show in July, Superior took a number of first and second place honors with their Kenworth trucks, including best fleet, best paint scheme, best displayed fleet and best straight truck ‘single specific’ purpose.